Imo is one of the 36 states of Nigeria and is in the south east region of Nigeria. Owerri is its capital and among the largest cities in the state. Its other major cities are Orlu, Obowo, Imo|Orlu]], Oguta, Mbaise and Okigwe. Located in the south-eastern region of Nigeria, it occupies the area between the lower River Niger and the upper and middle Imo River. The Orashi River has its source in Imo State. Imo River, being the major river in the state, drains through Abia State, where it is joined by Aba River from the north, and Akwa Ibom State into the Atlantic Ocean. Otamiri River and its 9.2 km length tributary, Nworie River, flow in the state. There are other rivers and creeks in the state including Onas Creek in Ohaji/Egbema, Okitankwo River in Umudi, and Ohia and Efuru Rivers in Okigwe. The state has several natural resources including crude oil, natural gas, lead, Calcium Cabornate and zinc. Profitable flora including iroko, mahogany, obeche, bamboo, rubber tree and oil palm. Additionally white clay, fine sand and limestone are found in the state. Imo's major towns include Isu, Okigwe, Oguta, Orlu, Atta Ikeduru, Akokwa, Mbaise, Mbaitoli, Mbieri, Ohaji/Egbema, Orodo, Nkwerre, Ubulu, Ngor Okpala, Omuma, Mgbidi, Awo-Omamma, Izombe, Orsu, and Amaigbo, Umuowa Orlu, Isu/Umuozu. Many investment opportunities exist in the state including oil and gas exploration, chemical plants, brewery plants, hydroelectric plants, gas-fired power plants, grain mills, starch production, cashews, fruit and vegetable juice concentrate production, integrated multi-oil seed processing plants, ceramics, inland waterway transport, and palm produce industry. Independent global brewer Heineken, through its subsidiary Nigerian Breweries, has significant investment in Imo State. The company manages the world-class Awo-omamma Brewery, a multiple-line plant. The chief occupation of the local people is farming, but due to over-farming and high population density, the soil has greatly degraded. The cash crops include oil palm, raffia palm, rice, groundnut, melon, cotton, cocoa, rubber, and maize. Consumable crops such as yam, cassava, cocoyam and maize are also produced in large quantities. The rainy season begins in April and lasts until October, with annual rainfall varying from 1,500mm to 2,200mm (60 to 80 inches). Imo State came into existence in 1976 along with other new states created under the leadership of the late military ruler of Nigeria, Murtala Muhammad, having been previously part of East-Central State. The state is named after the Imo River. Part of it was split off in 1991 as Abia State, and another part became Ebonyi State. Imo state was created at Ngwoma and the meetings for the state creation which began after the Nigerian Civil War ended in 1970 were chaired by Chief S. E. Onukogu. The state has over 4.8 million people and the population density varies from 230 to 1,400 people per square kilometre. Christianity is the predominant religion. 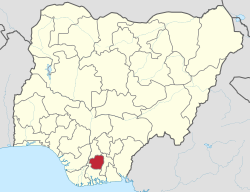 In addition to English being the official language, Imo state is a predominantly Igbo speaking state, with Igbo people constituting a majority of 98%. ^ "2006 Population Census" (PDF). National Bureau of Statistics of Nigeria. May 2007. Archived from the original (PDF) on 26 June 2011. Retrieved 27 July 2010. ^ a b "C-GIDD (Canback Global Income Distribution Database)". Caeeeanback Dangel. Archived from the original on 11 March 2012. Retrieved 20 August 2008. ^ a b c d e f g h i Vanguard, Nigeria (2 June 2015). "Exploring the resource control option – Imo State, by Futureview CEO, Elizabeth Ebi". vanguardngr.com. Archived from the original on 8 December 2015. Retrieved 30 November 2015. ^ a b c d e f "About Imo State". Imo State, Nigeria: Imo State Government. Archived from the original on 17 July 2010. Retrieved 27 July 2010. ^ "Industries in Imo State". Imo State, Nigeria: Imo State Government. Archived from the original on 14 March 2010. Retrieved 27 July 2010. ^ Vanguard, Nigeria (14 March 2014). "Imo Govt discovers more crude oil". vanguardngr.com. Archived from the original on 8 December 2015. Retrieved 30 November 2015. ^ "HEINEKEN majority owned subsidiaries Nigerian Breweries plc and Consolidated Breweries plc to merge". www.theheinekencompany.com. 9 May 2014. Archived from the original on 7 February 2016. Retrieved 3 January 2016. ^ "Nigerian Breweries invests N3bn in Awo-Omamma, N18bn in Aba Breweries". beverageindustrynews.com.ng. 8 December 2015. Archived from the original on 5 January 2016. Retrieved 3 January 2016. ^ Vanguard, Nigeria (14 March 2014). "Imo Govt discovers more crude oil". vanguardngr.com. Archived from the original on 8 December 2015. Retrieved 16 January 2016. ^ "Niger Delta Region Land and People" (PDF). www.nddc.gov.ng. Federal Republic of Nigeria. Archived (PDF) from the original on 6 March 2016. Retrieved 16 January 2016. ^ a b "Climate and Weather - climate info and current weather in Nigeria". www.wordtravels.com. Archived from the original on 23 October 2017. Retrieved 29 April 2018. ^ a b "Regions Used to Interpret the Complexity of Nigeria". Geographical Alliance of Iowa. University of Northern Iowa. Archived from the original on 14 April 2009. Retrieved 19 July 2007. ^ Ihiegbulem, Emeka (17 December 2009). "Nigeria: Erosion - Ihioma Network Appeals to FG". Archived from the original on 12 October 2012. Retrieved 29 April 2018 – via AllAfrica. ^ "Physical Setting: Imo State". OnlineNigeria.com. Devace Nigeria. Archived from the original on 26 September 2007. Retrieved 13 August 2007. ^ "IMO STATE - OnlineNigeria.com". www.onlinenigeria.com. Archived from the original on 26 August 2015. Retrieved 29 April 2018. ^ "Local Government Organization in Imo State". Library of Congress Pamphlet Collection – Flickr. Retrieved 11 May 2014. ^ "Imo State". www.igbofocus.co.uk. Archived from the original on 14 October 2017. Retrieved 29 April 2018. ^ "Education in Imo State". Imo State, Nigeria: Imo State Government. Archived from the original on 16 July 2010. Retrieved 27 July 2010.